That’s right. All will soon be well. The problems that exist in the Middle East, for which no one has come up with a foolproof solution, will all be sorted out, or, at a minimum, they will all be explained with absolute objectivity. You see, Katie Couric will be going to Iraq and Syria. The country will be fine. Maybe she will even write her own stuff! My very favorite Katie Couric Moment occurred early in 2004 on the Today Show. 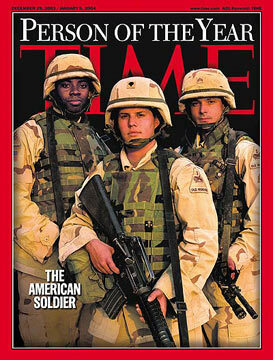 Time Magazine had just named “The American Soldier” as Person of the Year (See magazine cover above). The Today Show audience was primed for Ms. Couric’s interview with the two gentlemen who were responsible for the cover story. The audience did not know that Ms. Couric was laying in wait, ready to spring. The “Six P’s” come to mind: Prior Planning Prevents Piss-Poor Performance. I can only imagine the bloody flailing of her staff that took place after the broadcast. ** Thanks to Jerry for the correction (see comments). The Six P’s strike again. Maybe I could get a gig with Katie Couric.